We take a look ahead to the first leg of the Carabao Cup semi-final tie between the two London rivals on Tuesday night at Wembley. The hosts will head into this tie full of confidence, having racked up seven goals against third tier Tranmere Rovers at the weekend. To boot, Pochettino's side have the psycological advantage heading into the match, having emphatically beaten their London rivals in the equivalent Premier League clash between the teams earlier on this campaign. Perhaps this competition is Tottenham's most realistic chance of silverware this season, as they remain clear underdogs both in the title race and the Champions League, and the FA Cup is still in its formatory stages. To that end, it is expected that Maurico Pochettino will put out his best side against Chelsea on Tuesday evening. In terms of personnel available to the 'Spurs' boss for the clash; Belgians Jan Vertonghen and Mousa Dembele could be available, although they will need to come through late fitness tests to feature. Aside from this, the home side will have a full compliment of stars chomping at the bit to face one of their arch rivals. 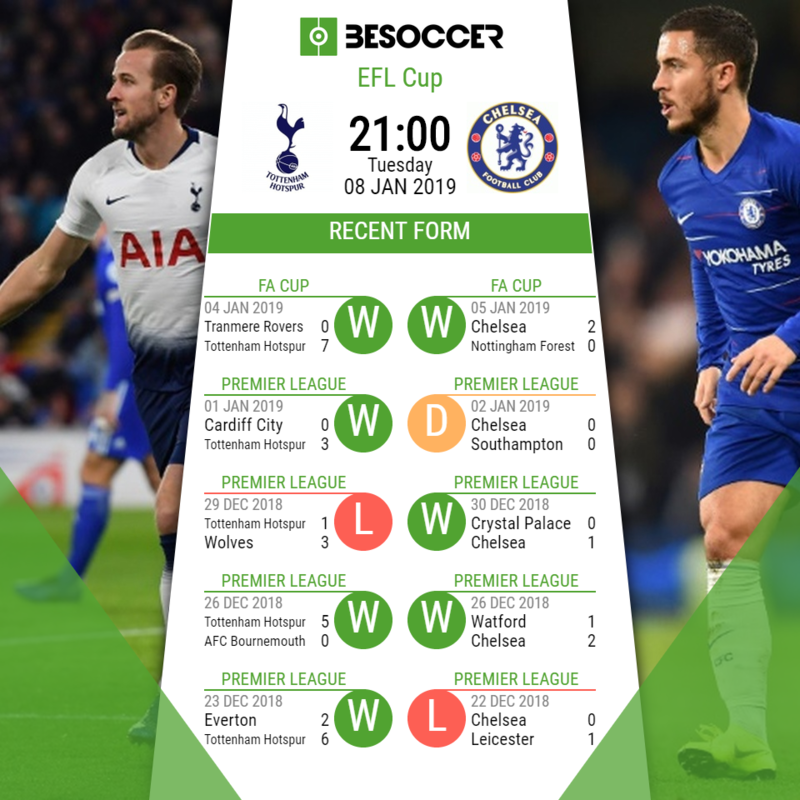 Visitors Chelsea look like another side that must have high hopes to lift this particular trophy, given their lack of presence in the title race, and seeming intent to focus on a top four finish than winning the Europa League. However Sarri's side will have to overcome the demons that saw them completely outplayed by their opponents the last time they made the short trip to Wembley. In his maiden year in England, Maurizzio Sarri made a phenomenal start, but since the League annihilation at the hands of Tottenham in November, his squad have been in somehwat inconsistent form. To that end, the Italian will surely be focused on progressing in this particular competition to add a first domestic trophy to his CV. Regarding absentees for this clash; midfielder Ruben Loftus-Cheek suffered a recurrence of a back injury, and as such may miss this clash as he spends a few weeks on the sidelines. "The approach is always to play in the same way and try to win the game. Every single game we play in the Premier League, Champions League or cups is always about scoring goals and not conceding." "It is very difficult. The level of the opponent is very high. We have had to play against Liverpool. Now we have to play against Tottenham, and in an eventual final it would probably be against Manchester City. It’s like playing in the Champions League, but in the League Cup." "‘Sometimes during matches we have not had the right reaction to difficulties and negative situations. We need to learn we cannot lower our application in the defensive phase." This tie will be Tottenham's 15th League Cup semi-final; only Liverpool (17) have appeared in more throughout the history of the competition. Should Chelsea lose this first leg at Wembley, they will become only the second side to lose back to back matches against the same opponent at the venue in a single season. The unfortunate record is currently held by Sheffield Wednesday, who lost the FA Cup final replay and the League Cup final to Arsenal in 1992-93. Chelsea have qualified for four of the previosu five League Cup finals when the first leg of the semi-final tie pitted them away from home.